Having the swimming pool furniture becomes the hot trending for some people today. Therefore, some stores provided a variety of pool furniture have been visited by people who really love swimming pool. The reason why they choose the swimming pool furniture is to make the pool as comfortable as possible when they are swimming or relaxing there. 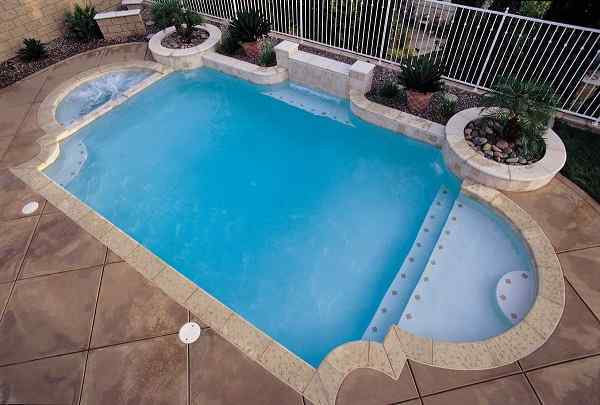 They strive in completing the pool furniture with a low price as they can. 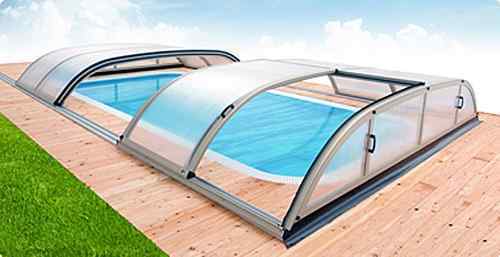 But, for some people, it does not matter how much the cost is to buy the pool furniture so that they do not get the best quality with affordable price. Therefore, we must be smart buyer in taking any kinds of pool furniture provided in some stores. 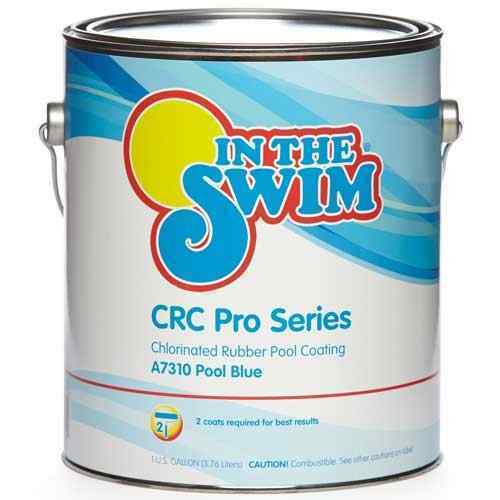 There are some stores that offer the pool furniture with low price under $500. Well, we share you some store that offers the cheap one. 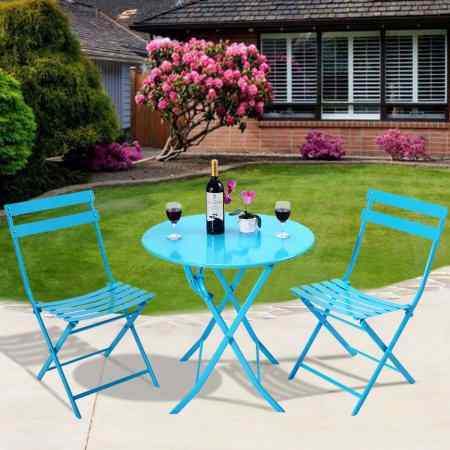 The chair set includes 2 chairs and 1 table that is foldable stored easily. The set is made from the metal construction with processing of powder spray to get the corrosion resistant. 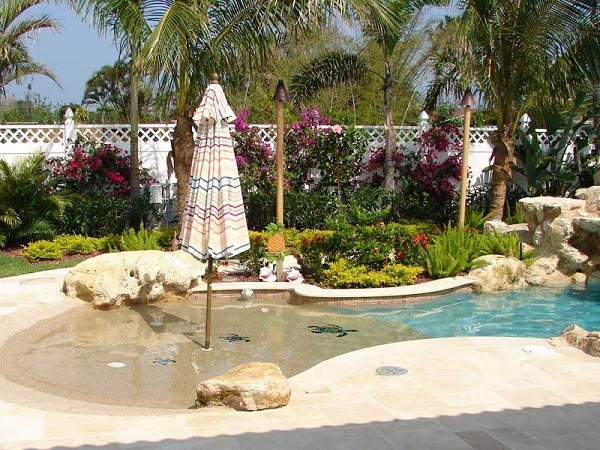 It is perfect to complete your outdoor furniture such as pool, garden, and patio. 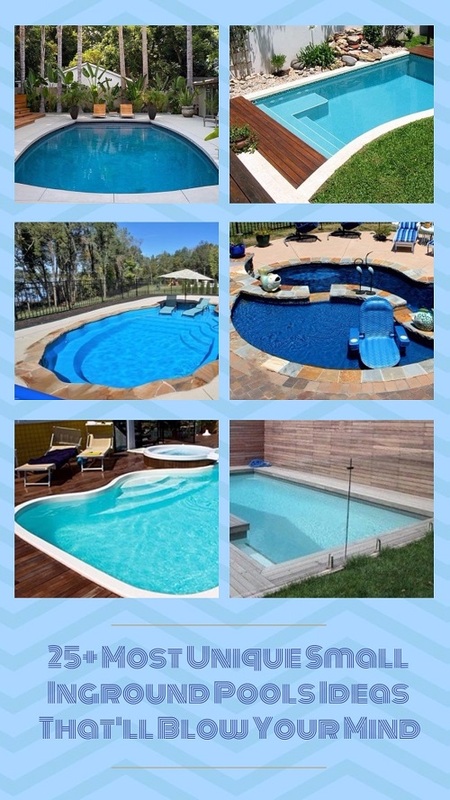 With artistic, unique style and bright blue actually add the beautifulness of your pool. Actually, made from the iron enable to get sturdy and durable for long usage. You can get it with a $75.98 at Walmart. Now, sitting and enjoying the hot coffee after swimming. Chair Weight Capacity 246 lbs. Table Weight Capacity 44 lbs. If you feel bored with the common furniture in the pool, try to complete it with the bar table set. Perfected your pool with Outsunny rattan wicker bar and make it as comfortable as possible. Certainly, you are courage to invite your friends to come joining the swimming. 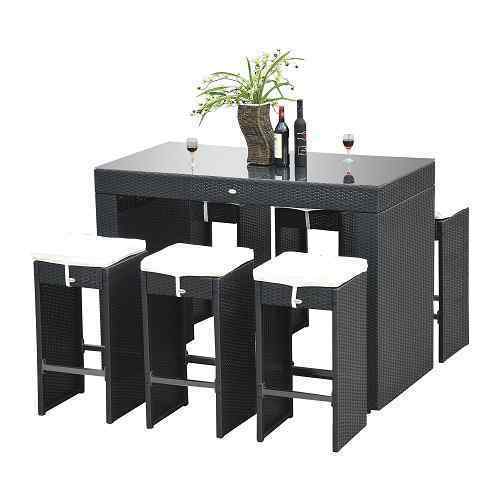 The bar set is made from rattan that is well-known as the durable material and weather-resistant which can use for years to come. Completed by polyester cushion cover, the stain and water resistant feature, it enable you to easy cleaning. You’ll enjoy to sitting on with extra soft cream-white cushions. 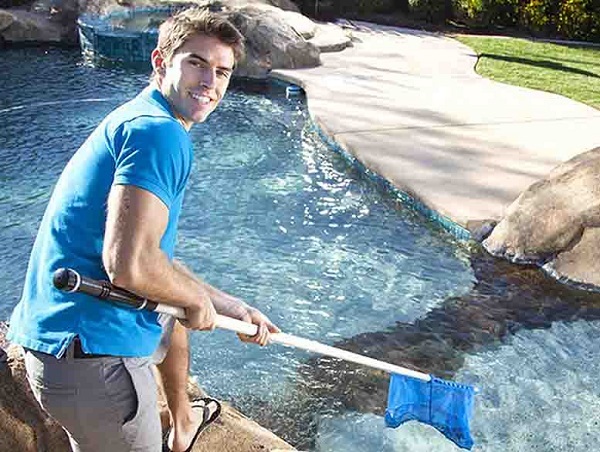 Ideally, it is good for your backyard and outdoor site. Getting it under $500 with a $499 at Amazon. Relaxing your body after swimming on the tufted hammock under the sun is really desired deed for everyone. With the comfortable position, you can pressure your back, hips, neck and knees while taking a breath the fresh air. This hammock is made from the polyester fibers with a classic rope. The weight limit is about 450 lb. It is matched with rope spreaders and solid wood. You can purchase it with a $500 at Frontgate. Need to know that this hammock is made from USA with stand sold separately. The Sunbrella Tufted Hammock dimension is 78″ D x 55″ With 25 lbs. 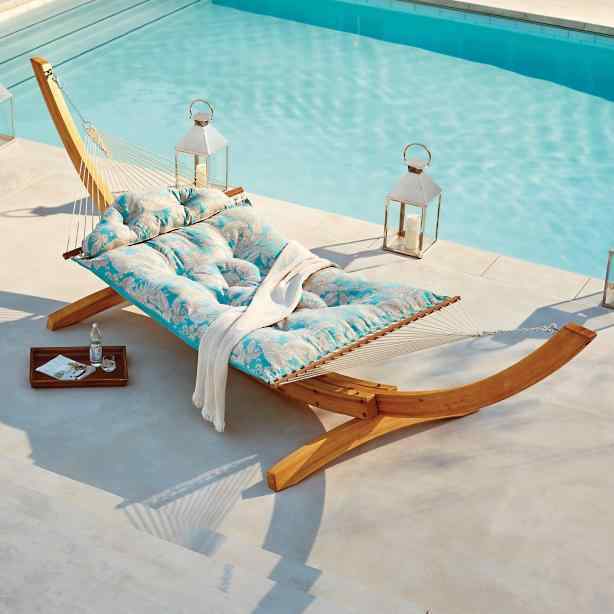 Complete your swimming pool with the luxurious and adorable pool furniture. The pool is nothing without the lounge attends on. The green cushion actually adds the natural looks for your outdoor space especially, the swimming pool. It is constructed with brown wicker to get the durable for all weather. The lounge also is completed by adjustable angle back for easy folding and stacking. You can absolutely enjoy the sunbathing while drinking the juice or soft drink. The lounge chair dimension is about 27.5″ W x 79.5″L x 13.8″H. The price is about $449.99 at Amazon including 2 green chaise lounge cushions and 2 outdoor wicker chaise lounges. You will not get long time to get the outdoor relaxation comfort. Completed by the excellent dual seated rocker actually can keep the sunlight coming down into your face. Coming with elegant and trendy design actually it is a great choice for completing your pool furniture. Made from the durable material can maintain in getting the long lasting. 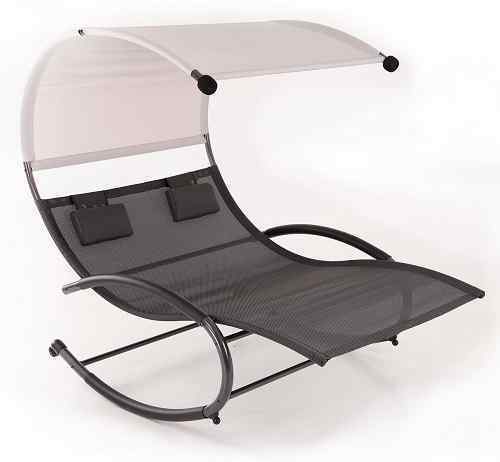 It is constructed by 2 removable head cushions and lightweight powder coated the frame. Furthermore, the polyester canopy can block the UV rays when you’re reading your favorite magazine. You can purchase this one at Walmart for about $355.55. No less important furniture is adding the pool seat in the swimming pool. Actually, the seat is ready to throw in the pool without must add the internal weighting system. Its weighs is about 15 lbs. For the dimension: 23″H x 18″D (top) x 18″D (bottom). There are holes that allow the seat sinking on the pool with 3 to 3.5 feet of water depth. The seat is flexible seating that you can use easily that can you apply and remove when you done with this seat. Moreover, you can spend your money about $189.99 for getting this product at Amazon. Make your swimming pool more fun with the swan float set that can add the pool more lively. The float set includes 4 pieces swan float that can be used for adults and kids. The dimension is 74″W x 75″L x 45″H with inflatable construction and multi-color. The price of this product is about $469.99 at Hayneedle. 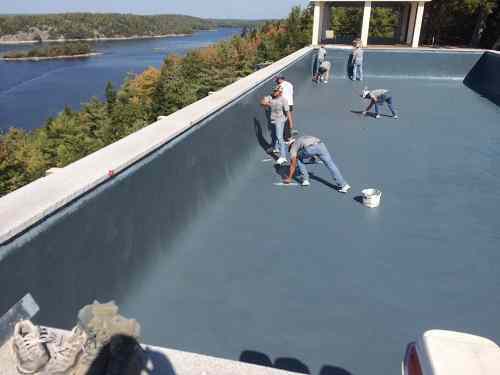 Furthermore, it is constructed with durable vinyl material which certainly getting long term for years to come.